Look at this blokes name. I want a name like Plantagenet Somerset Fry. You certainly won't forget that in a hurry. A good book by the way. Unravels the mysteries of history. 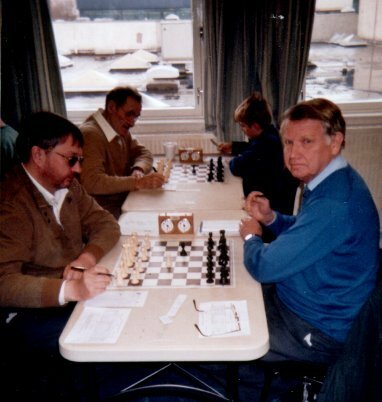 Philip Best (black v John Massa) and Gordon Davis (black v Simon Kellet). This was the Pentland Hills v Corstorphine match that was played on a train. I don't know why. Possible part of a Chess promotion. Anyway here is a picture of the above players. playing against the ex Aberdeen centre half Donald Smith. Here is a picture of the train there where on. in the back ground? That is the Black Crested 'snorkel' Gull. Not usually seen on these shores. It's a native of Denmark. Must be across here to get away from the flu. until move 19 when black is supposed to play 20...f6. Good. That means I do not have to discuss the first 20 moves. N.Abbasi(2280) - E. Szalanczy (2420) The Balatonbereny open 1994. It featured the same sac 20...Rxd4. Black lost. I'll give the full game after Massa v Best. that this game was the second longest to follow theory. The top is still Berry v Grassie. 118 moves in the Caro Khan. Edinburgh 1956 (I won't be giving that game). The big decision moment was on move 23. Attack or defend? In the following position he played the tame 23 Nde2. move must be 23 Nd5 and if 23..e6 24 Ne3 hitting the Bishop. analysis does not belong here. due to the number of extra black pawns. and with 23...Qa5 white is always on the defensive. The forest of black pawns seem unstoppable. And as promised here is the N.Abbasi - E. Szalanczy game. There may be possible improvements for black. as played in the following game. better way to play it for white. R.Slobodjan (2500) - T.Heuer (2290)Germany 1996.
so onto the second game. Simon Kellet v Gordon Davies,Pentland Hills v Livingston. This was monster of a game. 74 hard fought moves. should never had been given an opportunity to arise. I do not know what Simon was doing on moves 17-19.
simpler would have been 17 h3 instead of B(b5)-f1, h3, Bb5. So Black manages to obtain counter play on the King side. See the triple up on the f-file. starts again. This time on the Queen side. Look at this position 14 moves later. Doubled up on a-file. You would hardly think it was the same game. air if White could only nurse home his passed c-pawn. 65...Rd6 66.Nf5 Rd3 and the pawn queens. and Rook will easily stop them. the Rook stop white's passed pawn. Draw. have moved into the second car business. 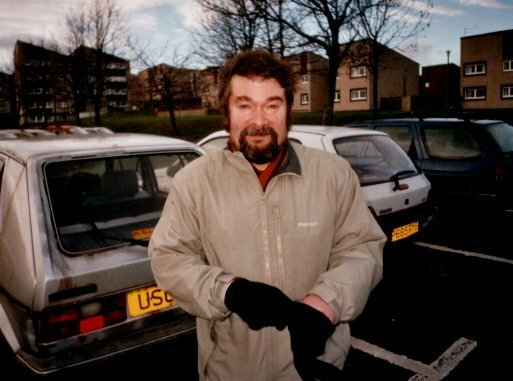 Would you buy a second hand car from this guy? Come along down to 'Happy Don's' for the deal of the year.